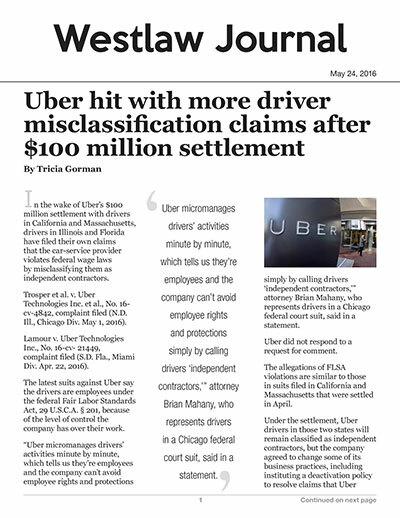 In the wake of Uber’s $100 million settlement with drivers in California and Massachusetts, drivers in Illinois and Florida have fied their own claims that the car-service provider violates federal wage laws by misclassifying them as independent contractors. Trosper et al. v. Uber Technologies Inc. et al., No. 16- cv-4842, complaint fied (N.D. Ill., Chicago Div. May 1, 2016). Lamour v. Uber Technologies Inc., No. 16-cv- 21449, complaint fied (S.D. Fla., Miami Div. Apr. 22, 2016). The latest suits against Uber say the drivers are employees under the federal Fair Labor Standards Act, 29 U.S.C.A. § 201, because of the level of control the company has over their work. “Uber micromanages drivers’ activities minute by minute, which tells us they’re employees and the company can’t avoid employee rights and protections simply by calling drivers ‘independent contractors,’” attorney Brian Mahany, who represents drivers in a Chicago federal court suit, said in a statement. The allegations of FLSA violations are similar to those in suits fied in California and Massachusetts that were settled in April. Under the settlement, Uber drivers in those two states will remain classifid as independent contractors, but the company agreed to change some of its business practices, including instituting a deactivation policy to resolve claims that Uber randomly terminated drivers. The agreement awaits approval by the U.S. District Court for the Northern District of California, but nearly two dozen objections have been fied since the settlement was announced April 21. O’Connor et al. v. Uber Techs. et al., No. 13-cv-3826; Yucesoy et al. v. Uber Techs. et al., No. 15-cv-262, settlement announced (N.D. Cal. Apr. 21, 2016). The day after San Franciscobased Uber announced the settlement, Miami resident Jean Lamour sued the company in the U.S. District Court for the Southern District of Florida. Lamour alleges Uber avoids the minimum wage and overtime provisions of the Fair Labor Standards Actby improperly classifying drivers as independent contractors rather than employees. “The drivers’ services are fully integrated into Uber’s business and, without the drivers, Uber’s business would not exist,” the suit says. A week later, Illinois driver Lori Trosper fied similar claims in the U.S. District Court for the Northern District of Illinois. Both suits seek compensatory and punitive damages for unpaid wages on behalf of Uber drivers nationwide. Trosper’s suit specifially excludes drivers in California and Massachusetts, and also names Uber CEO Travis Kalanick as a defendant. The drivers accuse the company of cheating them out of customer tips and failing to reimburse them for employment-related expenses. Uber has taken away the customary 20 percent tip by telling its customers there is no need to directly tip the drivers because a gratuity is already included in the total cost of the car service, the suits say. The suits allege Uber’s level of control over the drivers makes them employees, not independent contractors. Uber determines the price that drivers charge customers, tracks drivers’ trips and hours, provides wage statements and must approve a driver’s car, the suits say. “Uber treats the drivers as employees,” Trosper’s complaint says. In an interview with Westlaw Journals, Mahany said Uber’s steps to address driver disputes on a piecemeal basis — settling with drivers in two states and moving for arbitration in others — simply encourages the fiing of similar suits by drivers seeking to be paid at least minimum wage. The company will eventually have to address the larger, underlying issues in the suits, he said. The collective actions fied in Illinois and Florida are just the latest claims seeking unpaid wages and other damages from Uber. Judges in Arizona, Maryland and Florida have recently sent drivers’ misclassifiation suits to arbitration, fiding that the drivers’ agreements with the company clearly include arbitration clauses and that the plaintiff failed to opt out of the provisions. Sena v. Uber Techs. et al., No. 15-cv-2418, 2016 WL 1376445 (D. Ariz. Apr. 7, 2016); Varon v. Uber Techs., No. 15-cv- 3650, 2016 WL 1752835 (D. Md. May 3, 2016); Suarez v. Uber Techs., No. 16-cv-166, 2016 WL 2348706 (M.D. Fla. May 4, 2016). Drivers for the luxury Uber Black service in Philadelphia recently attempted to block the company’s attempt to have their FLSA and other claims moved into arbitration. Razak et al. v. Uber Techs. et al., No. 16-cv-573, opposition to motion to dismiss fied, 2016 WL 2605245 (E.D. Pa. Apr. 29, 2016). While Uber argues that the drivers agreed to arbitrate disputes in their latest contract signed in December, the drivers say arbitration is not mandatory, pointing out that the plaintiff and 240 other drivers opted out of the provision.